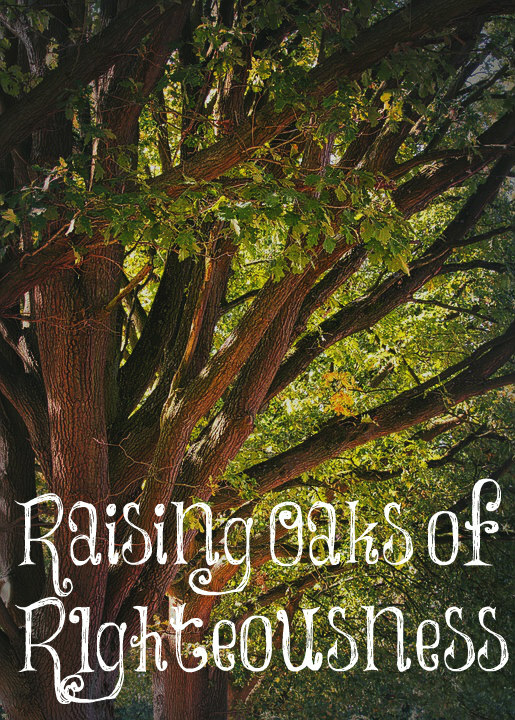 Are you raising oaks of righteousness? Does the Word of God dwell richly in your children? Do your children have deep roots in Jesus? “God is trying to produce oak-tree Christians – Christians with deep roots, who have learned obedience, who have ‘strong trunks’ that are not easily swayed by the winds or trials” (Linda Dillow). Our children must learn obedience from a very young age. They must learn what the word “no” means and that if you say “no,” you mean “NO!” There must be swift and consistent consequences for all disobedience. We are told in Hebrews that Jesus learned obedience from what He suffered (Hebrews 5:8) and our children must, too. As many of you know, I have suffered greatly throughout my adulthood and I have learned obedience because of my sufferings. The things of this world don’t hold as much pull on me anymore. I don’t mind the negative and cruel comments that are written about and to me on a regular basis because I know Whom I serve and want to please. “Blessed is the man that walketh not in the counsel of the ungodly, nor standeth in the way of sinners, nor sitteth in the seat of the scornful. But his delight is in the law of the Lord; and in his law doth he meditate day and night. And he shall be like a tree planted by the rivers of water, that bringeth forth his fruit in his season; his leaf also shall not wither; and whatsoever he doeth shall prosper” (Psalm 1:1-3). Parents are commanded to raise their children in the nurture and the admonition of the Lord. If you are putting your children in public schools, I pray you seriously reconsider since your children will walk in the counsel of the ungodly, stand in the way of sinners, and sit in the seat of the scornful. They will spend their childhood with those who are not even allowed to teach the Word of God. This is another reason why it’s so important that mothers be home full time with their children in this wicked and adulterous generation. Your children need your protection. They need your comfort, nurture, and training. No one can take your place in your children’s lives. Please, go home, young mothers, and teach your children all about the Lord and His beautiful ways. Impart godly wisdom into them daily. Read the Bible to them consistently so they will have deep roots in the Lord. “To appoint unto them that mourn in Zion, to give unto them beauty for ashes, the oil of joy for mourning, the garment of praise for the spirit of heaviness; that they might be called trees of righteousness, the planting of the LORD, that he might be glorified” (Isaiah 61:3) We are to raise trees of righteousness – godly offspring. This is a command of the Lord. We must raise a generation of virtuous people, not entitled snowflakes! I love being around people who love me most all the time. I love raising them to know the Lord. I’m so thankful to Him for this life. Several times a day I’m still in awe that this is my life! He has been so good to me. The freedom in my life is wonderful. I think many women have blinded themselves not to see the advantage of raising their children full time. There is no downside. I don’t think many parents consider what a great gift they give their children when they teach them obedience and self control. I think it’s like most things with children- the older we get, the harder it is to learn. Structure and discipline are good things. One need only to open the book of Proverbs to see. If, as children, we learn obedience to our parents, I think we will be more likely to be obedient to God. Raising our children for the Lord is the best thing we can do for our children. I am loving being a mum of teenagers (and 2 not teenagers yet). Many people complain about their teenagers – about their obnoxious attitudes and their rebellion etc. But my teenagers are awesome young people. They are (for the most part) responsible, respectful, obedient, polite. They know the Bible fairly well. They love coming to church. They know God’s standard for our lives. None of them have officially made their choice to serve the Lord yet (but they’re only 14 and nearly 16 so there is still time) but they definitely love God, and that’s evident in their actions every day. I pray daily that they will make their choice officially, soon, and they won’t be led astray by the things of the world. I worry though, as they attend public school (a Catholic one, although we aren’t Catholics… but it’s still a public school with fairly normal public school standards). They have worldly friends. They associate every day with people who aren’t Christians. And I can’t change that, so all I can do is pray. It does take a lot of hard work to raise respectful, God-loving teenagers, but it is so, so worth it. This is not in relation to what you wrote, but I wanted to say THANK YOU for standing firm about women staying home with their children and being keepers at home. 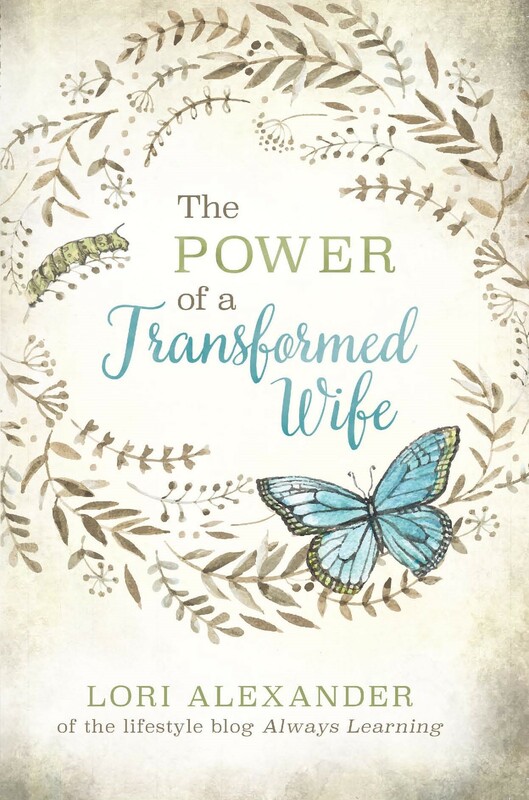 There is so much false teaching about women needing to go out and get a career and follow their dreams and go after their hearts, that they end up doing just that and not realizing they are forfeiting their greatest treasure which is their children and bringing them up in the Lord. I want to encourage you to keep standing on the Word of God and keep teaching this to women. I feel so strongly that this is the will of God for all women!!! Women need to be home and keep it and their children. Thank you, Steffanie! I believe there are women out there that want to be home but don’t think they should. This is who I write for. I certainly is the will of God for all mothers to devote themselves to home and family to follow a career which in any way weakens that commitment is a sin. I personally think that the most important thing is for children to see their parents set the best example they can in living a Godly life. For their mother to be at home, and to show respect and obedience to her husband and for their father to provide for, protect and guide his family. Children should be taught Christian morality and the Godly roles of men and women. But it is all the better if they can grow up in a family which is living that way. The following Anecdote was very insightful, and seemed very appropriate for this site, to let all know the evil forces arrayed against motherhood and children. The book is called, ‘The anti-Mary exposed: Rescuing the culture from toxic feminism’, and it’s by Millet’s sister, Mallory. That’s very sad and most are falling for it hook, line, and sinker. Beautifully written, Lori. I am so thankful I get to raise my children in the love and admonition of the Lord! What a privilege! Amen. Thank you for writing posts like this! I so appreciate an older woman rising up to boldly speak the things almost no one else will. I just found your blog this evening, and am very encouraged.